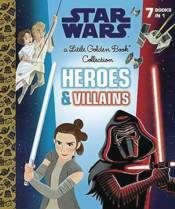 Learn all about the heroes and villains of Star Wars in this collection of seven Little Golden Books-in one deluxe volume! The Star Wars: I Am a . . . Little Golden Book Collection includes I Am a Jedi, I Am a Droid, I Am a Pilot, I Am a Princess, I Am a Sith, I Am a Hero, and I Am a Stormtrooper in one hardcover volume. Featuring stunning retro illustrations, this collection is perfect for Star Wars - and Little Golden Book - fans of all ages.